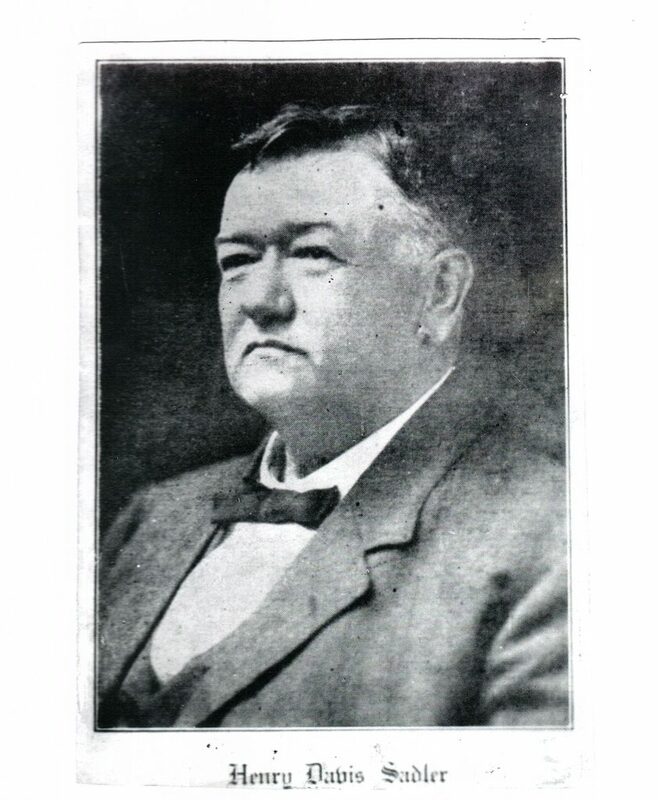 On April 7, 1862, Henry Davis Sadler was born to John Walker and Othella Wharton Sadler about five miles from where he died sixty-three years later, having lived in and served his Cleveland County Arkansas community throughout most of his life. John Walker and his wife had migrated from Tennessee and settled on a farm near the town of Rison in 1850. There they raised eight children. Henry Davis was the second son in the family. As a young man he worked as a deputy in the County Seat (at that time in old Toledo). Later he taught school and saved enough money to go to the University of Arkansas Medical Department in Little Rock. From that institution he graduated in 1891 with a M.D., at age twenty-nine. He first established his practice in Rison, then moved to Thornton, Arkansas for four years, returning to Rison in 1896. In 1911 Dr. Sadler left once again to take a post-graduate course at Tulane University in New Orleans, Louisiana. Returning to Rison he remained to serve his community until his death. He was held in high esteem by his medical colleagues. On January 29, 1899 he married Annie B. McLendon (born about 1873 in Cleveland County, Arkansas). The couple had three children, Guy M., Harold D, and Tom. Guy became the editor and publisher of the Cleveland County Herald newspaper (published by three generations of Sadlers). Harold, at one time Secretary to Congressman James Reed, became a minister and a columnist for the Cleveland County Herald. As many doctors in the early 1900s, Dr. Sadler tried merchandising to help support his family. He dropped that as his practice grew. Riding a white horse was the way he made house calls in his early years carrying his black doctor’s bag of medicines along with him. As time progressed he bought a Model T touring car. During the 1918 flu epidemic Dr. Sadler asked his son, Harold, to drive him to see his patients. It was an around the clock desperate operation. While the doctor treated the patients, Harold kept a tea kettle of hot water ready to assist in restarting the car. They were up day and night in an unusually cold winter caring for patients with flu, striving to prevent pneumonia and death. Though Dr. Sadler was a man well known as a successful medical practitioner, he also had extended influence within the business and civic community: was one of the originators of the bank, served on the town council for many years, believed in education – was a 20 year member of the school board and gave time and money to its activities. He was known as a man of high principles, for his constant pleasant disposition, his ready smile, and his invaluable council and advice. For nearly forty years he held membership in the Culpepper A.F. and A.M. Lodge. Dr. Sadler died from a sudden illness called in his time, “neuralgia of the heart” on October 28, 1925 and is buried at the Greenwood cemetery in Rison. He had practiced medicine for thirty-four years.